Crispy caramelized garlic sugar snap peas can be whipped up in about 20 minutes! 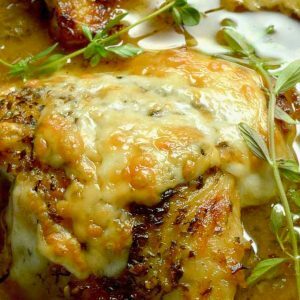 Easy side dish recipe for weeknight dinners or special occasions. 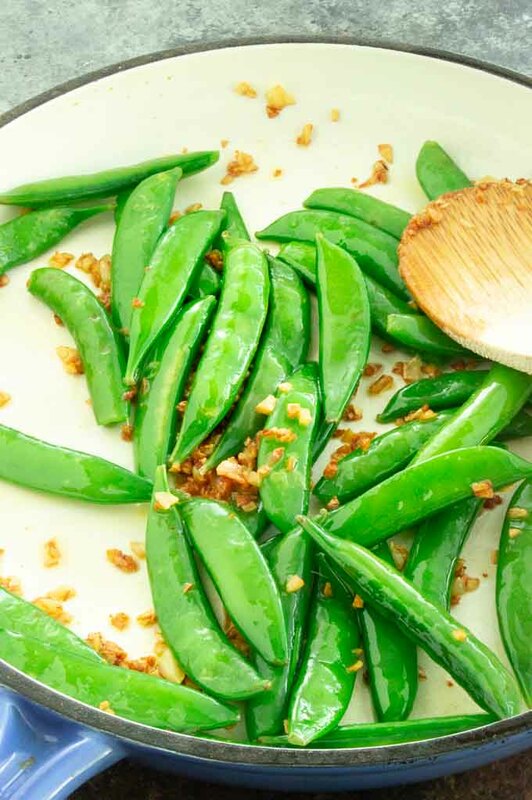 This Garlic Sugar Snap peas recipe is one of the easiest vegetable dishes to make. 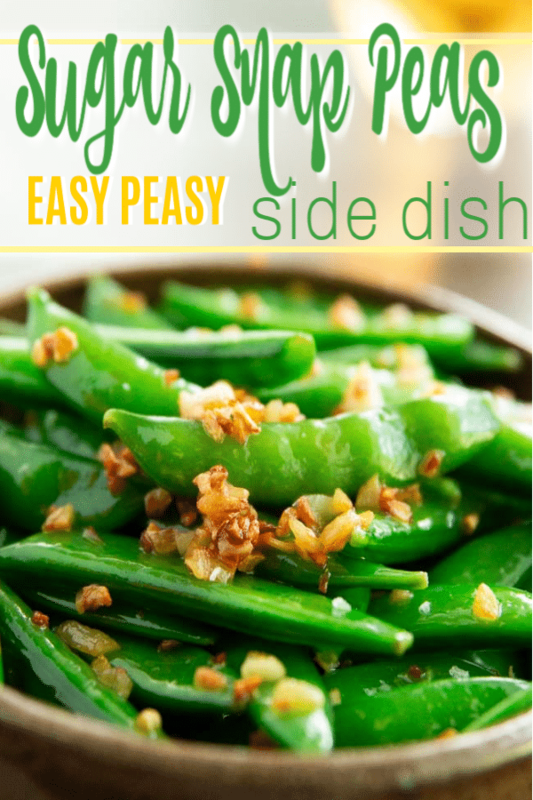 Made with fresh sugar snap peas and minced garlic you get a perfectly cooked side dish in less than 20 minutes. 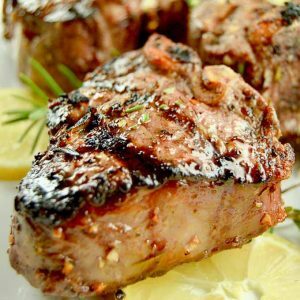 When entertaining Im really conscious of having delicious side dishes that are easy and don’t take a lot of work. I’d rather spend the time on the main course or appetizers than the side dishes. 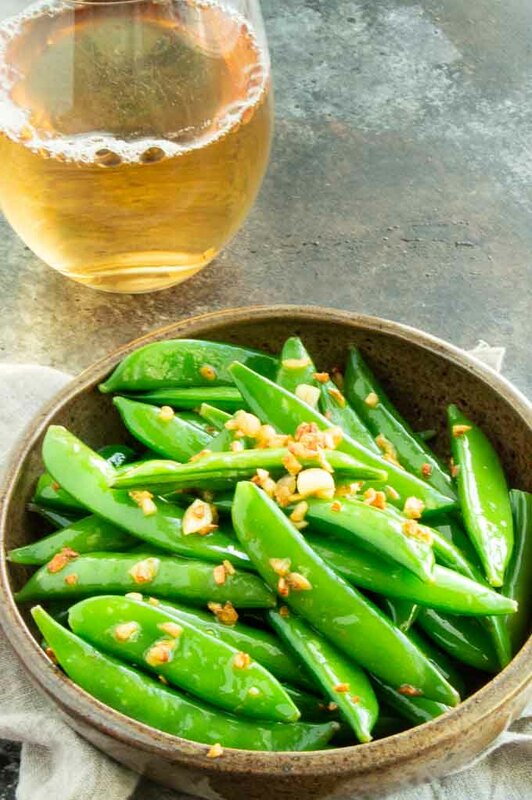 Sugar snap peas are perfect for an easy accompaniment to your delicious dinner. 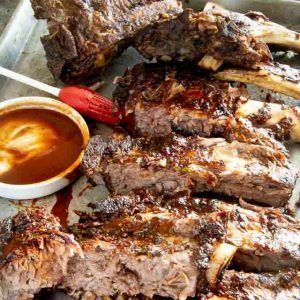 Not only do they take only take about 20 minutes to make them, but you can make them early in the day and then do just a quick stir fry to heat them up at the time you are ready to serve. 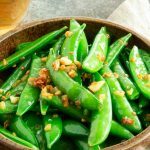 Sugar snap peas are a healthy vegetable that make a great side dish on their own, but if you add minced garlic and sauce them you will LOVE them! Super crisp, not soggy at all and full of flavor from caramelized garlic, olive oil and a little bit of salt and you will be in happy land! 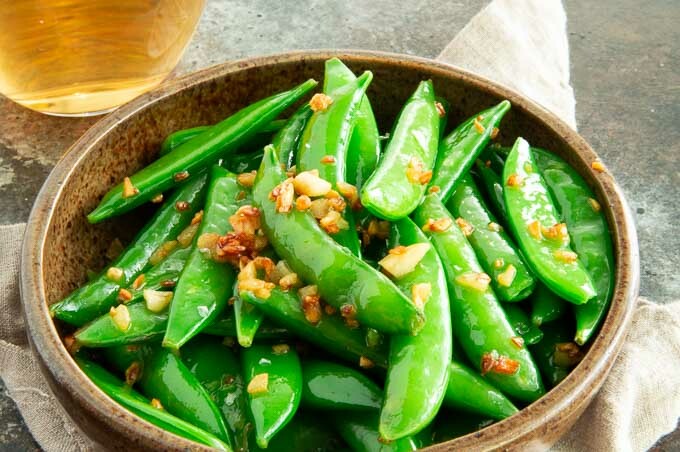 What is the difference between snow peas and sugar snap peas? Sugar snap peas are actually a cross between a garden pea (green peas) and a snow pea. Snap peas are a little thicker and more round than a snow pea. Snow peas are super thin and the “peas” inside are super small. Snap peas have an edible pod that has a tender and a sweet pea (actually several of them) that are sweeter than a regular garden pea. And just for the record, snap peas and sugar snap peas are the same thing. Some say they have the sugar designation because they are a little sweeter than garden peas! Snap Peas are a heathy vegetable option for maintain a balanced diet. They are naturally gluten-free, cholesterol free, and fat free. 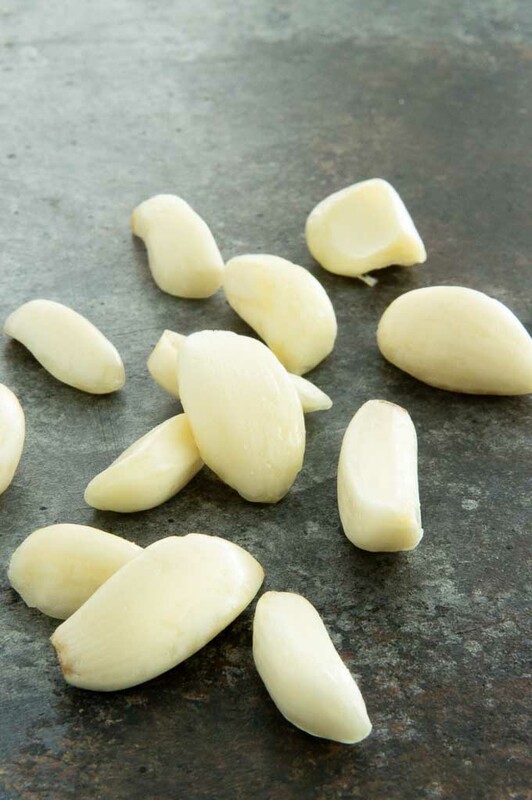 They are also a great source for Vitamin C.
Buy fresh garlic. If there is green in the center it can be bitter when you cook it. Mince the garlic super fine and try to keep the mince a similar size so the garlic can cook evenly. 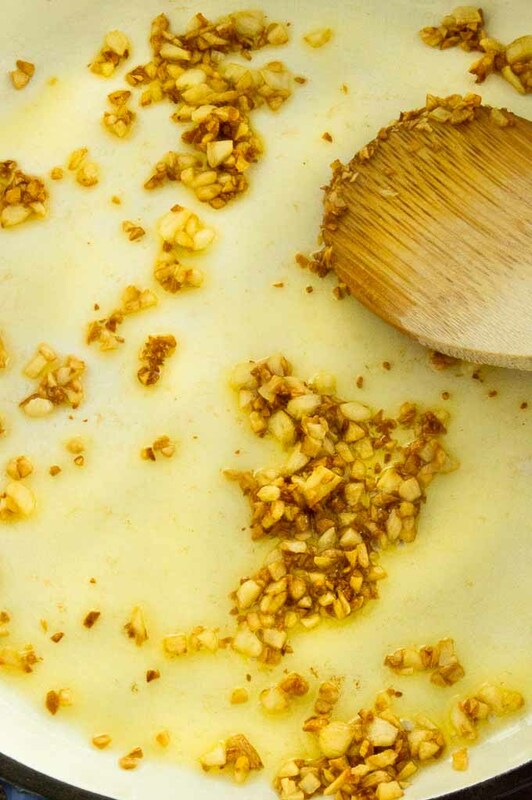 Heat the olive oil and add garlic when it’s hot to avoid the garlic absorbing all the oil. 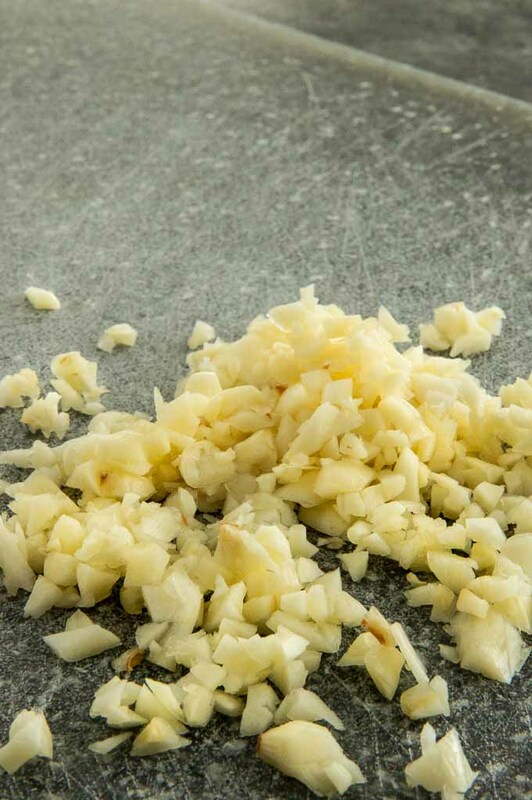 Cook the garlic on low heat, stirring often so it won’t burn. Blanching the snap peas not only helps keep them a nice bright green color but it makes it so you can cook them super quickly once you add them to the sautéed garlic. Be sure and drop the peas into an iced water bath to stop them from cooking after blanching them to avoid soggy, mushy snap peas. Once garlic is toasted add the snap peas in to rewarm them just before serving. I highly recommend a special finishing salt to toss on right before serving. Finishing salt is usually a large flake salt that you add on right before serving. It adds texture and just the right amount of salt over the top. I’m entertaining a bunch of people and have a lot of things happening at once. Can I make garlic snap peas ahead of time? You sure can make this side dish ahead of time. Prepare them ahead to the step where you warm the snap peas up after blanching. You will want to leave the snap peas in the water bath to stop cooling for just two minutes then drain the water and keep them in a bowl in the fridge until you are ready to warm them. 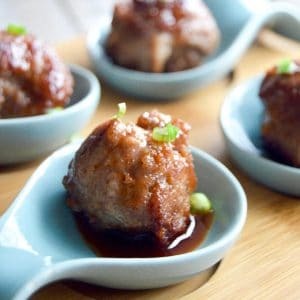 I love sugar snap peas but they aren’t available all year long where I am, can I freeze this recipe? You can freeze the sugar snap peas but I would suggest doing the garlic sauté on the day you plan to eat them. How to freeze sugar snap peas? Prepare an ice bath by filling a bowl of ice and adding water to it. Drop in the snap peas then let them cook for 90 seconds. 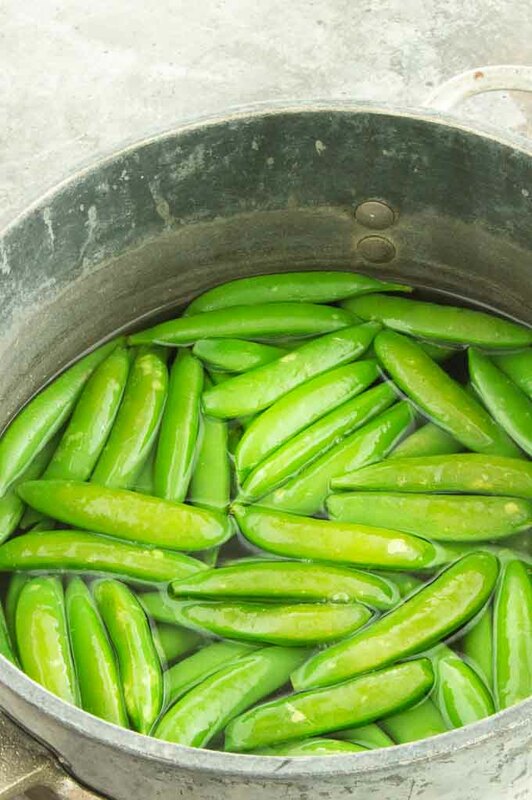 Once you remove the snap peas from the boiling water, immediately drop them in the ice bath for two minutes. Drain away ice bath, place the peas on a single layer on a tray that will fit into your freezer. Freeze for about an hour, until completely frozen. Remove from tray and pop them in either a zip lock bag or a sealed freezer container. (See my absolute favorite freezer container to use here!) ** Its my favorite because they are stackable and they snap perfectly so I know they are sealed! They will keep for about 6 months. Anything special to prepare the raw vegetable before cooking them? It’s your call if you choose to snip the ends of the peas. You may also want to pull the string that runs down the sides of the snap peas. If you are buying super fresh snap peas the string and ends will be super tender and this step can be avoided! Do I have to blanche the sugar snap peas? Can’t I just sauté them at the end to avoid that extra step? I highly reccomend that you blanch the peas. It will give you the beautiful green color and there is less likely chance you will over cook the snap peas and avoid having a mushy side dish. More Vegetable Side Dishes you might enjoy! Creamy Scalloped Potatoes~ my go to for every special occasion! Ginger Sweet Potato Soup~ have a soup that you can make several days ahead instead of a salad! Sauteed Green Peas with Proscuitto~ when you want traditional green peas instead!! Trim ends of snap peas. Prepare an ice bath. Fill a large bowl with ice then add in water to cover ice. Have it ready next to the sink so once you blanch the snap peas you can immediately drop the peas into the ice bath. Bring a pot of water to boil. Once the water is boiling add the snap peas and cook for 90 seconds - 2 minutes. Drain and immediately drop peas into the ice bath to stop cooking. Leave in ice bath for 2 minutes, then drain water and shake off as much water as possible from the peas and set aside. SEE NOTES IF PREPARING EARLY IN THE DAY. While the water is coming to a boil, peel the garlic and mince to very small pieces. Try to keep the pieces close in size so they cook evenly. Place a heavy bottom pan onto the stove top and turn the heat to medium. Add olive oil. 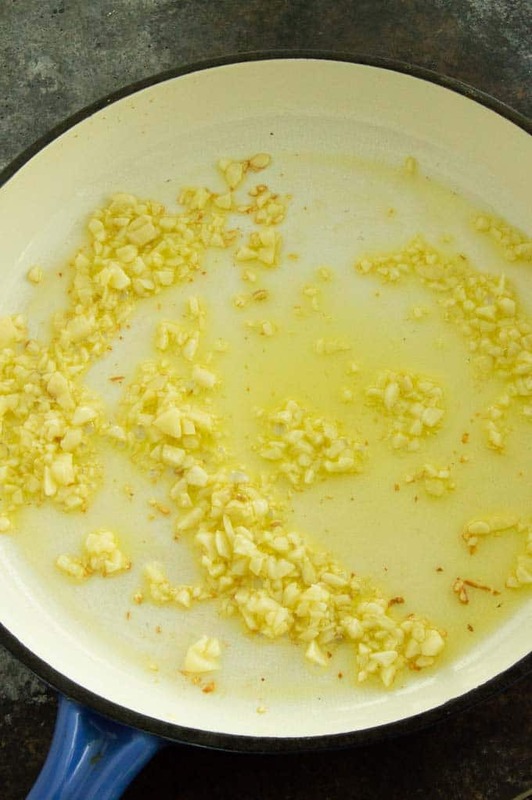 Once the oil is hot, (about a minute) add the garlic and cook for about 10 minutes stirring continually. Don't be tempted to raise the heat to cook them faster. Once the garlic is a nice caramelized golden brown you'll add the drained, blanched snap peas to the skillet with the garlic. Sauté for 5 minutes until snap peas are heated thru. Snap peas will be cooked but al dente with a crisp bite. If you prefer a softer snap pea, sauté for 7-10 minutes. Place in a bowl for serving and sprinkle finishing salt and pepper. Serve immediately. If preparing early in the day blanch the snap peas as directed. Caramelize the garlic to a nice golden brown. Then remove pan from heat. Stir in drained peas and set aside. Once cooled you can place in the fridge if its for more than a couple of hours. When ready to serve you will heat the pan to medium and cook until beans are hot and are cooked to al dente. It will take a little bit longer if they have been chilled in fridge and are very cold.